Will we all wake up in a new country tomorrow morning? 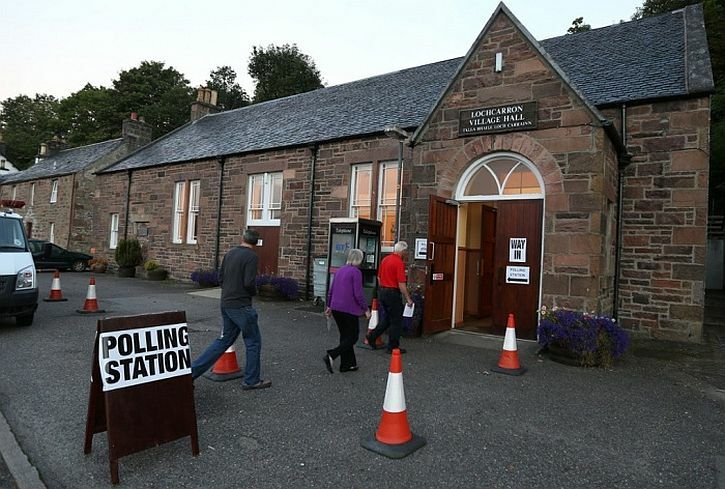 Whichever way the Scots vote today, it looks like we could be in for interesting times. So, some very brief thoughts. If I were resident north of the border, I think I might have voted Yes. This is an extrapolation from how I feel living in a northern city forced by a London government few people here voted for to make savage and soon to be unsustainable cuts to public services. And I how I feel about a political elite more concerned to bail out the banks for their grievous errors; one dedicated to cutting taxes paid by the rich rather than funding investment in the nation’s health, education and well-being. The fiercer, more uncompromising, often utopian nationalism that now grips some Scots possesses echoes in other parts of the world. In part this is because the relentless advance of globalisation has fostered a desire in many countries for a more distinctive and reassuring local identity. This trend is particularly marked in Europe because it contains so many ancient, culturally distinctive groupings – like the Catalans in Spain – who do not possess a state of their own, and want to have one. It’s this aspect of the Scottish campaign that I strongly identify with: if there was a referendum here in Liverpool tomorrow on whether the city – or a city-region perhaps encompassing Manchester as well – should have more power over local services, and more freedom to raise taxes to fund those services, I would unhesitatingly vote Yes. At first sight, how attractive it looks for each locality to raise tax and spend its share of national income as best suits local circumstance. Localism sounds comforting. It is indeed high time to give back powers Margaret Thatcher stripped out and replace the millions of council homes she sold. Labour would give local health and wellbeing boards some NHS powers. Schools and further education should be returned too. Borrowing to build, councils should sell bonds. The Scottish public are not much interested in distinctions between supposedly incompatible variants of self-rule like devolution, independence, quasi-federalism and so on. What they want is to run their own affairs, never mind what the arrangement is called. I think the Welsh, Liverpudlians, Mancunians, Geordies and the Cornish would like to run their own affairs as well – and sod the banks, global corporations, the London government – and, sadly, probably the European Union, too. Fundamentally the issue is democracy. In the post-independence debate about how the remaining parts of the UK are governed, the elephant in the room will be devolution for England. Regional assemblies elected under a proportional system with Holyrood-style powers would offer us the opportunity to address the inequalities that have opened up between London and the rest of the country. 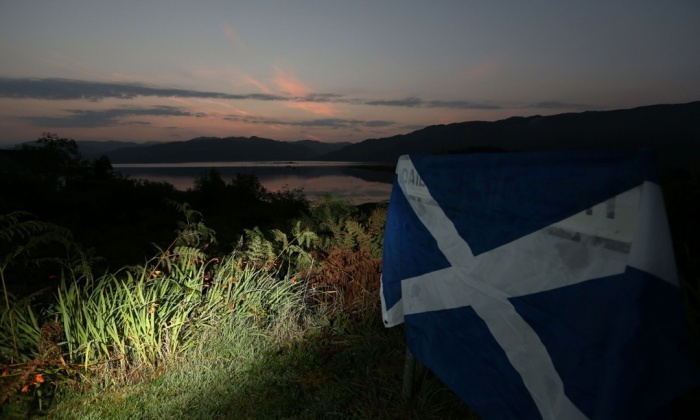 Support for Scottish self-determination might not fit neatly into any leftwing pigeon hole, but it does chime with an older progressive tradition that runs deep in English history – a dogged determination to hold the over-mighty to account. If, during the constitutional settlement that will follow the referendum, we in England can rediscover our Roundhead tradition, we might yet counter our historic weakness for ethnic nationalism with an outpouring of civic engagement that creates a fairer society for all. A clear vote for No – yet 45% of Scots, including majorities in the cities of Glasgow and Dundee, voted to leave the Union. The turnout was an astonishing 84.6%. So where now? Curiously, the rejection of independence for Scotland seems to have led to a clamour from Tory backbenchers and UKIP for English independence – to which Cameron’s opportunistic response has been to open up the question of whether Scottish MPs should be allowed to vote on ‘English’ matters in the Westminster Parliament. Since such matters include health, education, human rights and social care this smells to high heaven of crude party manoeuvring and threatens a situation where, even with a Labour government, the Tories could out-vote policies in those crucial areas. (See Helena Kennedy, Constitutional reform: English votes for English laws cuts two ways). So, in England at least, we appear to be exactly where some feared we’d be if the Scots voted to leave us. Even SNP figures say independence won’t return to the agenda for a generation. This is unlikely to be true. Scotland is being carried along on a process of steady institutional, political and social divergence from the rest of the UK, which will continue. The case for full self-government will make increasing sense in the next few years. The latest hasty suggestions for increasing the powers of the Scottish parliament are little more than a rehash of existing proposals judged some years ago to be hopelessly behind the curve. Anyway, Mr Cameron now proposes to embed them in a vaster constitutional reform for all Britain. This is unlikely to get anywhere serious, and would take many years if it did. If the Westminster system has one real expertise, it is for gently enfolding radical ideas, like a jellyfish with its prey, and dissolving them to transparent mush. In the past three days, Scots have looked at one another and asked: “What do we do with all that joyful commitment, with the biggest surge of creative democratic energy that Scotland has ever seen?” For many, perhaps thousands of people, it has been the most important public experience in their lives. Must it go to waste? Nearly one in two Scots, it seems, consider the United Kingdom as broken. Now that they must remain in it, some of their energy for change can go into fresh reforms through the devolved Scottish parliament – for example, giving back power to the people through a grant of real responsibility to local communities. Best of all, they should not break their hearts because they failed to bring their country into the world of free and sovereign nations. This referendum year leaves Scotland a transformed, empowered society. The men and women of yes should live and work as if they already belonged to an independent country. And perhaps, in a sense, that is what Scotland has now become. A society transformed and empowered ? Now that would be something to be. It’s not a long or particularly difficult walk up from the delightfully-named hamlet of Thundergay up to Coire Fhionn Lochan, the lake like a teardrop that nestles in a bowl hollowed out by glacial ice in the mountains a thousand feet above. But we did it on one of the last days of the long, cold spring of 2013; it may have been mid-June, but the wind battered us that day, making the going an effort, and the temperature did not speak of midsummer. 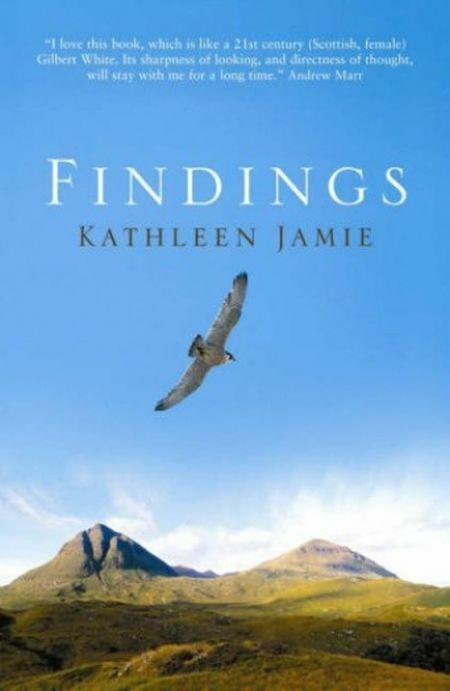 I’ve just spent a week or so in the company of Scottish essayist and poet Kathleen Jamie. It began last summer when I heard her reading extracts from her latest collection of essays, Sightlines, on Book of the Week. I liked what I heard and promised myself that I’d read the book when it appeared in paperback. A couple of weeks ago I did, and then immediately moved on to her previous collection, Findings. After that, totally impressed, I moved on to her first book Among Muslims and her latest poetry collection, The Overhaul. Findings and Sightlines are both published by Sort Of Books but it’s not easy to define what sort of books they are. Jamie herself has said that there doesn’t seem to be a term that captures the disparate topics that she ranges over in these essays. 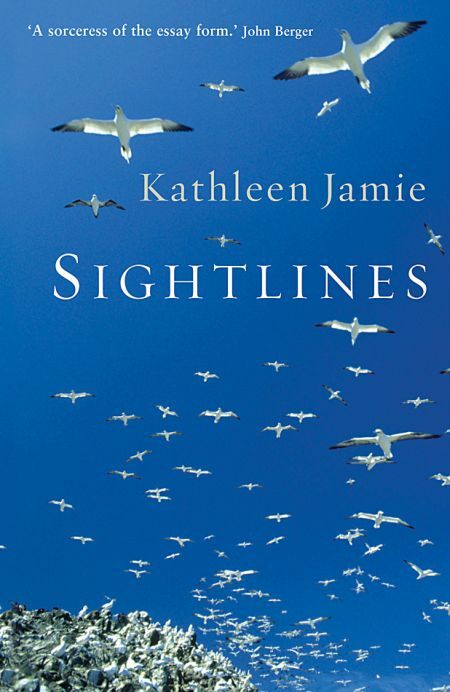 In Sightlines, in the very fine ‘Pathologies’ she ponders the meaning of ‘nature’, exploring the landscape of cells through a hospital microscope not long after she had sat by her dying mother’s bedside waiting for ‘nature to take its course’ and wondering what the phrase really means. Waiting to be discovered is a wildness which is smaller, darker, more complex and interesting, not a place to stride over but a force requiring constant negotiation. A lifelong negotiation at that: to give birth is to be in a wild place, so is to struggle with pneumonia. If you can look down a gryke, you can look down a microscope, and marvel at the wildness of the processes of our own bodies, the wildness of disease. There is Ben Nevis, there is smallpox. One wild worth protecting, one worth eradicating. And in the end, we won’t have to go out to find the wild, because the wild will come for us. Then, I guess, someone will scatter our ashes on a mountaintop, and someone else will complain. There’s nothing wild in this country: every square inch of it is ‘owned’, much has seen centuries of bitter dispute; the whole landscape is man-made, deforested, drained, burned for grouse moor, long cleared of its peasants or abandoned by them. It’s turned into prairie, or designated by this or that acronym; it’s subject to planning regulations and management plans. It’s shot over by royalty, flown over by the RAF, or trampled underfoot in the wind-farm gold-rush. Of course there are animals and birds, which look wild and free, but you may be sure they’ve been counted, ringed maybe, even radio-tagged, and all for good scientific reasons. And if we do find a Wild Place, we can prance about there knowing that no bears or wolves will appear over the bluff, because we disposed of the top predators centuries ago, and if we do come unstuck there’s a fair chance that, like the man on Ben Nevis, we’ll get a mobile signal, and be rescued. Wild is a word like ‘soul’. Such a thing may not exist, but we want it, and we know what we mean when we talk about it. And yes, we’re drifting here towards the religious. When we want to scatter someone’s ashes in a wild place, we know the kind of place we’re looking for. Further: we know what the wild is because we’re making small acts of reparation towards it. It’s noble to reintroduce species once persecuted into extinction, albeit as part of a management plan. Once reintroduced, though, they might show signs of being a bit self-willed: white-tailed eagles have an eight-foot wingspan. Recently, one took a flight round the Asda car park in Dunfermline. People were so alarmed they called the police. You could hide among the swelling numbers of genuinely unemployed, and claim a little money each week. That’s what people did: artists, diggers, mountaineers, would-be poets and musicians, anarchists and feminists. Anyone for whom the threat of a job, of conformity, felt like death. The weight and heft of a word, the play of sounds, the sense of carefully revealing something authentic, an artefact which didn’t always display ‘meaning’, but which was a true expression of – what? – a self, conciousness. Out of the shifting sea, the witless sky, out of the ambivalent world had come terrible certainty: a natural law, laid down in black and white, but mystery, too. Every year,in the third week of February, there is a day, or, more usually, a run of days, when one can say for sure that the light is back. Some juncture has been reached, and the light spills into the world from a sun suddenly higher in the sky. Today, a Sunday, is such a day, though the trees are still stark and without leaves; the grasses are dry and winter-beaten. The sun is still low in the sky, even at noon, hanging over the hills southwest. Its light spills out of the southwest, the same direction as the wind: both sunlight and wind arrive together out of the same airt, an invasion of light and air out of a sky of quickly moving clouds, working together as a swift team. The wind lifts the grasses and moves the thin branches of the leafless trees and the sun shines on them, in one movement’ so light and air are as one, two aspects of the same entity. The light is razor-like, edging grasses and twigs of the willow and apple trees and birch. The garden is all left-leaning filaments of light, such as you see on cobwebs, mostly, too hard to be called a sparkle, too metallic, but the whole garden’s being given a brisk spring-clean. Where there are leaves, such as the holly 200 yards away, the wind lifts the leaves and the sun sweeps underneath. All moving because of the fresh wind. Now the town’s jackdaws are all up in a crowd, revel ling in the wind, chack-chacking at each other. And I hear a girl’s voice, one of my daughter’s friends, one of the four girls playing in the garden. She makes a call poised just between play and fear. What are they playing? Hide and seek? No matter. It pleases me that my daughter says they are ‘playing in the garden’, because they’re eleven years old; another year or two and they wouldn’t admit to ‘playing’ at all, and for a while the garden will have no appeal, because everything they want will be elsewhere. For a few years they’ll enter a dark mirror-tunnel whose sides reflect only themselves. The girls themselves can’t be seen, obscured by trees and that edgy, breezy light. The year has turned. Filaments and metallic ribbons of wind-blown light, just for an hour, but enough. She is a deep thinker on the human condition and nature, and especially the relationship between the two. There is a refreshing lack of romanticism here; a realistic down-to-earthness that grounds her prose and makes it all the more accessible. The whole book is an experiment in honesty, a refusal to romanticise in a Vaseline-on-the-lens way. “I sail on the surface of understanding, a flicker here, a silence there,” she says, and all the time circles around the agonised status of what “nature” actually is. What does that word mean? What is nature? Everything we are? Or everything we are not? And do those two questions ever connect? She refuses to find any answers and as a result the book plays a subtle line between enchantment and disenchantment, between believing in nature and distrusting it. The book is suffused with a kind of tenderness, but she can also be funny, in an understated and melancholy way. In the museum in Bergen, full of the hunted, killed and flenched skeletons of dead whales, there are, “on a central pillar, neatly painted in Norwegian and English, the words ‘Do not touch the animals’, but it was a bit late for that”. And for all her scepticism about empty responses to the natural, she does not fight shy of the heroic. The climax of the book, and its most sustained performance, is the account of two weeks spent on Rona, the green island 40 miles north of the northern tip of Lewis, where she was counting Leach’s petrels and one day met a gang of killer whales, whose brutal, raging arrival at her oasis sears off the page like a knife. I don’t think I have ever read a passage which transcribes so exactly the deep unsettling weirdness of the wild. I worked my way back, then, to Findings, her first collection of essays published in 2005. In the piece which gives the collection its title, Jamie is frustrated by an easterly wind from her objective of landfall on St Kilda. Instead the skipper of the yacht in which she’s sailing deposits her on one of the Monach Islands. She’s never even heard of them before, never set foot in a yacht before, ‘never sailed the sea in anything smaller than a CalMac ferry’. 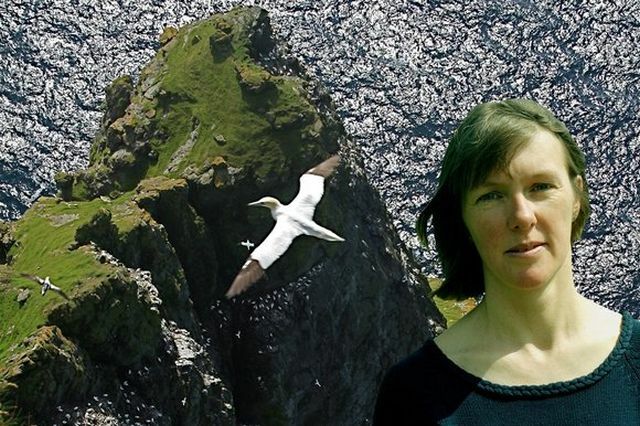 ‘I hacked off the gannet’s head with a penknife, which turned into one of those jobs you wish you’d never started.’ That’s the arresting opening sentence of this piece whose theme is the random objects we find in ‘wild’ places. Lying on her back by a small loch she notices a stand of flag irises, a white plastic tub trapped among their stems. 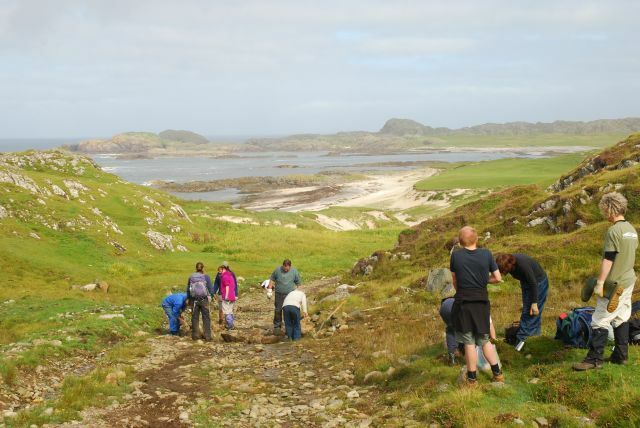 ‘The islands are a 21st century midden of aerosols and plastic bottles’, she observes, and muses on the things that she and the rest of her party had picked up along the shore, things they valued enough to keep. Apart from the gannet skull washed clean by the sea, she had kept two pale sticks (‘like the first man and the first woman’), an orb of quartz bits of a crashed aeroplane and pieces of whalebone. ‘It seemed that what we chose to take were not the things that endured, but those that had been transformed by death or weather’. They say the day is coming – it may already be here – when there will be no wild creatures. That is, when no species on the planet will be able to further itself without reference or negotiation with us. When our intervention or restraint will be a factor in their continued existence. Every creature: salmon, sand martins, seals, flies. What does this matter? 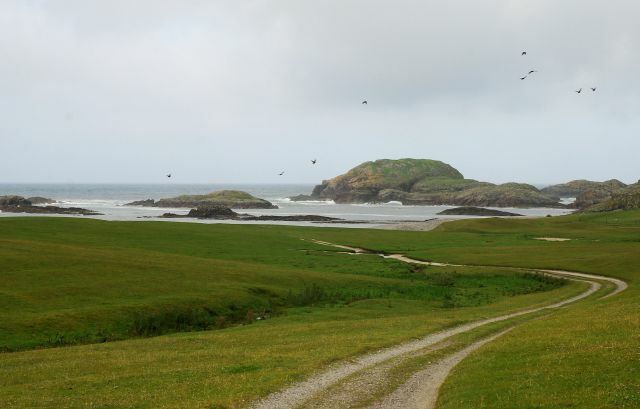 In one essay, Jamie journeys to the island of Coll to hear the call of a bird that, in the time of Constable and Clare, could be heard in every county of this land: the corncrake, Latin name Crex-crex, a perfect onomatopoeic rendition of its rasping call. In another, she notices cobwebs hanging from the gutter of her house. In the room behind, her husband is gravely ill. These essays were written during a traumatic period for herself and her family. Her mother is incapacitated by a stroke, her husband’s life threatened by a strange complication of pneumonia, the illness that devastates the lungs’ alveoli – that branching mesh that gives us breath, and that, if spread out, would cover an area the size of a tennis court with a fine, fine cobweb. Between the laundry and the fetching kids from school, that’s how birds enter my life. I listen. During a lull in the traffic: oyster-catchers; in the school-playground, sparrows. if we join up all these minutes we are beginning secularly to observe, we could string them together in a new kind of Sabbath, where there are no men in black blighting our lives with their notions of sin, no chaining up the children’s swings for the Lord’s day. I mean a contemplative time, a time reserved to reflect. Perhaps we would feel less imperilled. 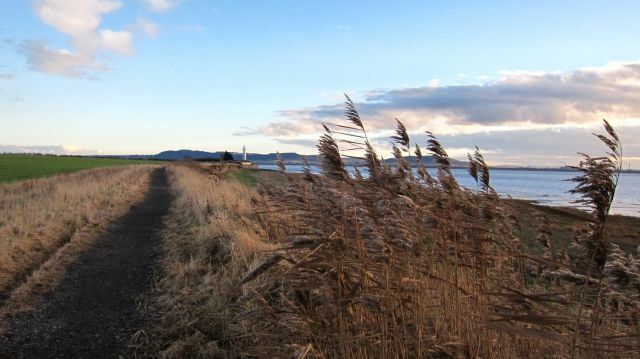 In November 2001, ten Pakistani men suddenly appeared in Kathleen Jamie’s Scottish home town. They are on a peace walk, a pharmacist, a draper, a glass merchant, a town mayor, a businessman, a teacher and a student of economics. Jamie remembers the welcome and hospitality she received when she travelled, a woman alone, in Pakistan’s Northern Areas in the early 1990s and invites them back to hers. This is the scene-setting opening of the new edition of Jamie’s account of her time travelling alone and living among the Shia Muslims in the mountainous region wedged between Afghanistan, India and China. and one of the most volatile borderlands in the world. 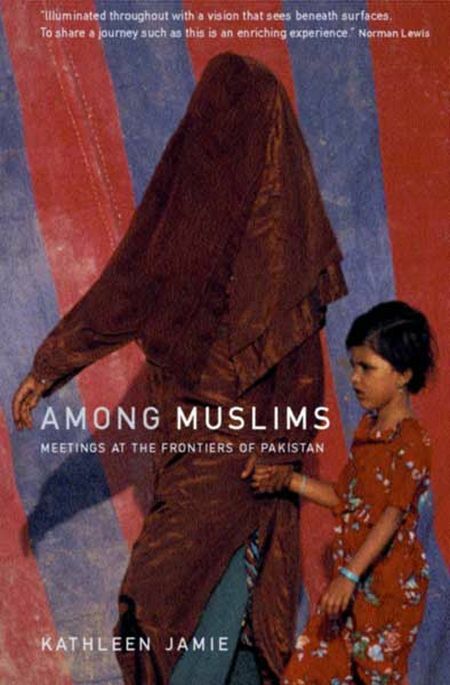 Originally published as The Golden Peak, for this edition – now entitled Among Muslims: Meetings at the Frontiers of Pakistan – Kathleen Jamie returned to Pakistan and adds a new preface and afterword. Among Muslims is a rare thing – an account of a privileged westerner’s travels among a people with a different culture, lifestyle and beliefs and having only limited access to the essentials of life that is sympathetic, non-judgemental – and, above all, superbly written. There was one crucial sense in which Jamie was privileged – as a single woman travelling alone she was able to slip into the role of ‘honorary man’ and have long conversations about history, politics or religion with men in bars or offices, as well as being invited into homes to spend time with purdah-observing women. I told him I was torn between staying with Westerners, in purdah, safety and seclusion. I can’t fully denounce purdah because we do it ourselves, we go in gangs everywhere and keep ourselves separate, in a little cultural bubble. 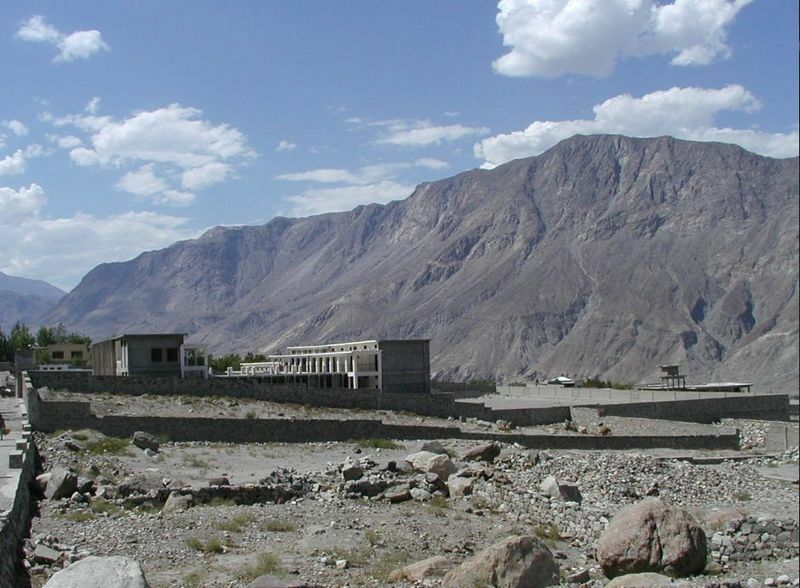 Gilgit: one of the towns in the Northern Areas where Kathleen Jamie stayed. I stood between earth and sky, and looked round. I couldn’t breathe for wonder. I’d climbed a ladder without rungs and squeezed through an old trap door, and so clambered into heaven. Behind us the rockfaces of the mountains rose to remote and jagged summits, and before us fell a cornucopia: the villages of Khapalu. They tumbled in golden terraces and green trees down to the banks of the great river. On all sides mountains bound our vision. The sky was intensely blue. Though all that Alison [a Scottish nurse working at a health centre run by Christian missionaries which she has just visited] knew was also true – that in the exquisite yellow fields, and among the groaning fruit trees and under the roofs of all the little houses I could see, there were people ignorant, sorrowful, superstitious and brutalised – it was a proper kingdom. I’d opened a book of fairy stories, and found a way in. ‘Well?’Arif called. He had clambered on to a rickety wooden skylight. ‘Oh, it’s . . . wonderful! Wonderful’ The three young bloods took up the cry, and whirled like dervishes around the roof calling, ‘Wonderful! Wonderful! Wonderful!’From her garden far below, the princess waved. We sat around the oil-heater, with a kettle on top, and told about our lives, the lives of women with families. We had young children and frail, elderly relatives, and jobs. That’s what ten years had done; turned us from Shia girls and Western girls into grown women – mothers and daughters, wives and teachers. then soon forgets . 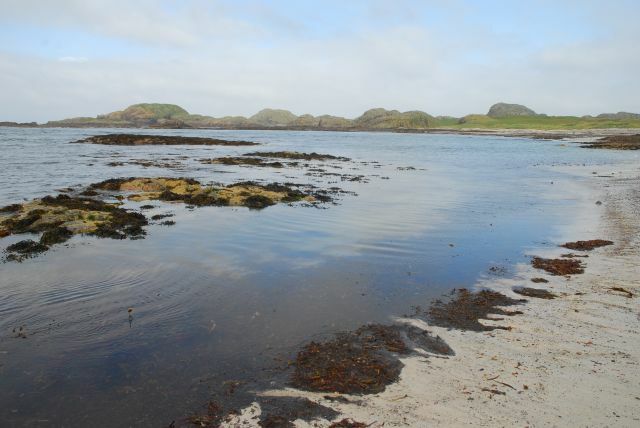 . .
On the far side of Iona is a bay of white sand and shingle where you can stand on the shore and look to the west, knowing that the next landfall is Newfoundland. 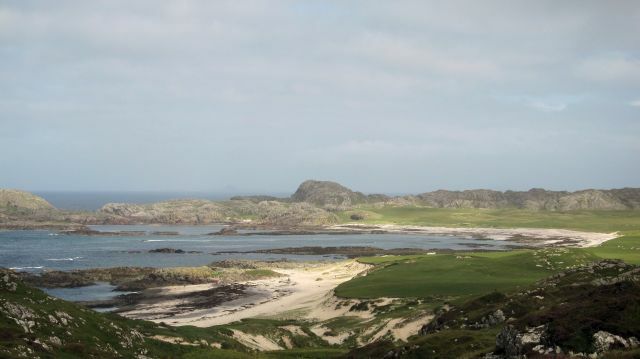 It’s a magical place with an enchanting name – Camas Cuil an t-Saimh in Gaelic: the Bay at the Back of the Ocean. We took the ferry to Iona from Fionnphort on Mull at ten o’clock on a bright Sunday morning. 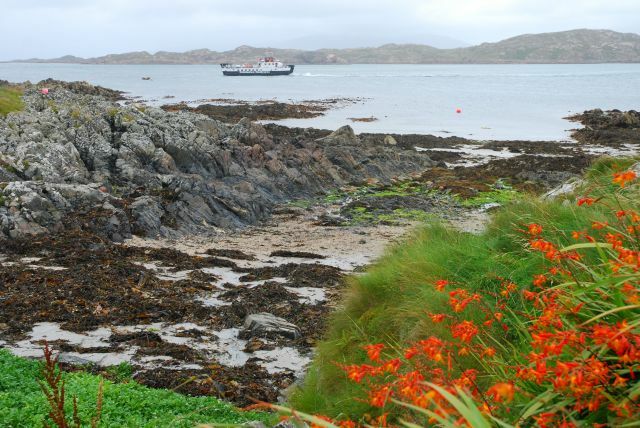 Leaving the ferry, most of the foot passengers headed towards Iona Abbey and the north end of the island, but our way took us south from the jetty, following the tarmac road past the island’s fire station and war memorial before turning inland to cross to the west side of the island. Where the road ends, we entered common grazing land that is also used as a golf course. 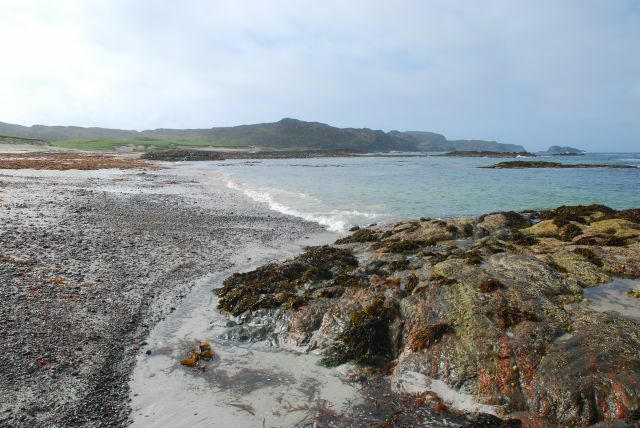 The lush green ground is another example of machair – the fertile grassland formed at the back of beaches where windblown shells and sand have improved the soil. The Bay at the Back of the Ocean spreads out before us, where the machair ends and a bank of shingle fringes the beach sand. 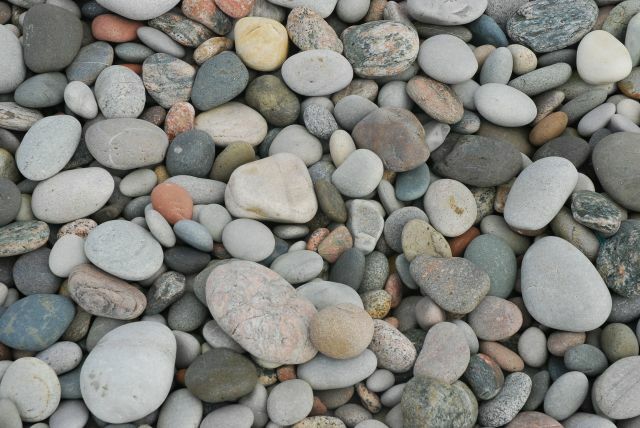 Here people have made circles and other shapes – a heart, a peace sign – from the colour-flecked stones washed ashore. Finally we wrenched ourselves away from this beautiful place, taking the track uphill that opened up great views back across the bay and the machair. Half way up the rise we encountered a group of those nameless volunteers who help maintain the paths we walk on. This group were clearing the gullies across the path that drained away floods of rainwater from the rocky hillside. 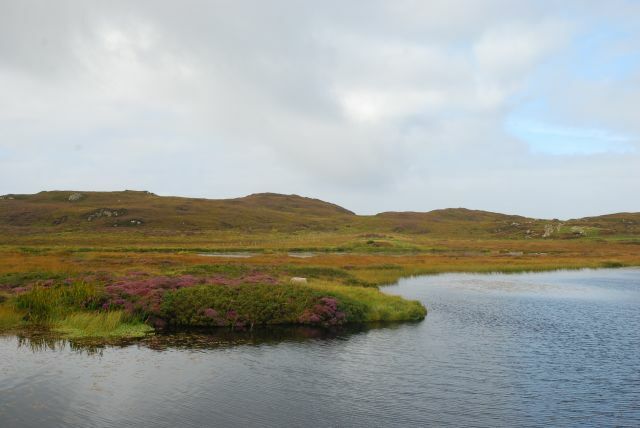 At the top of the rise, the track reaches Loch Staoineig, passing to the left of the loch which, right up to the 1980s, provided Iona’s water supply (water is now piped across from Mull). 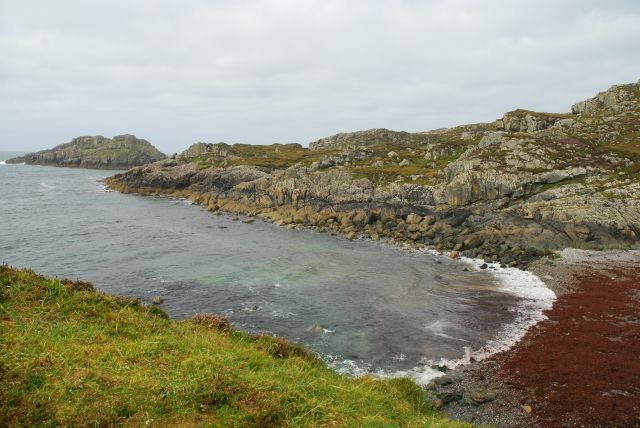 We continued south, eventually reaching a viewpoint overlooking St.Columba’s Bay, where St Columba stepped ashore in AD 563. In the middle of the bay is a hill known as the Hill of the Back to Ireland: it is said that Columba climbed this hill to make sure that Ireland was out of sight. He had left Ireland full of guilt at having triggered a clan war that left many dead, and had sworn that he would only settle when he longer had sight of his native land. He had previously landed at Dunaverty in Kintyre, but as Ireland was visible from there he sailed again until he reached this shore. The beautiful shingle beach here is backed by a level meadow that must be a stunning sight in late spring because we found it covered in the leaves of the iris, yellow flag. I spent some time sifting through the pebbles, picking one or two to take home as a memory of the place. Then I noticed that on the grass beyond the beach pebbles had been carefully laid to create stone labyrinths, a symbol which seems to have a special resonance for those who come on pilgrimage here (the Christian tradition on Iona seeming to have a definite New Age or mystical tinge). 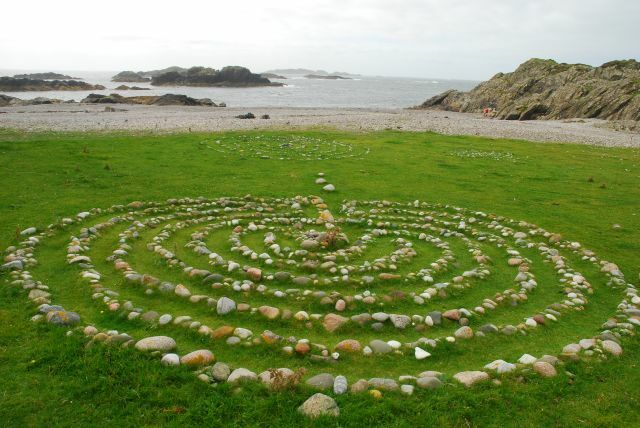 We had seen one of these labyrinths, too, the previous day on the tiny island of Erraid where the Findhorn spiritual community has a settlement. Intrigued at the ubiquitous presence of this symbol, I found that labyrinths have had a special meaning for human kind for well over 4000 years. There is evidence of the existence of the labyrinth symbol across southern Europe and North Africa from roughly 2000 BC, taking the form of rock carvings and paintings, inscriptions on ceramics, tiles and coins. The same basic design began to appear across Asia, the Americas and Southern Africa in an assortment of forms including rock carvings, wall paintings and wooden sculptures. Prehistoric labyrinths are believed to have served as traps for malevolent spirits or as defined paths for ritual dances. Roman labyrinths took the form of mosaic pavement labyrinths laid in the floors of bath houses, villas and tombs throughout the Roman Empire. The medieval period marked a new wave of labyrinth building , especially the many labyrinths found in cathedrals and churches across Europe from the 12th and 13th centuries. The most famous medieval labyrinth of this type is the one laid down in 1201 in the floor of the nave of Chartres Cathedral. These labyrinths were built for walking. They offered a bounded space for personal reflection, a symbolic form of spiritual pilgrimage. The next stage of our walk took us through very boggy ground where the path was faint or nonexistent. 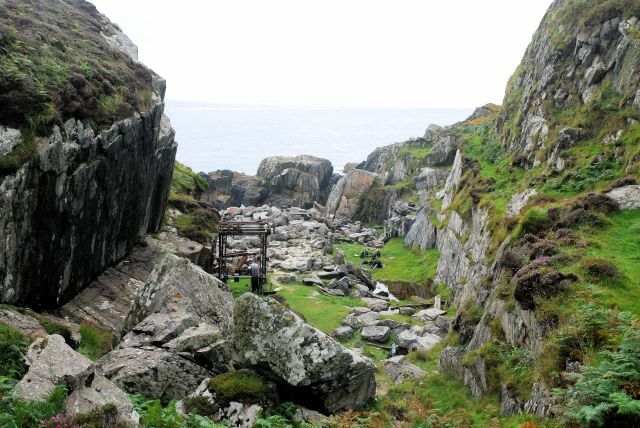 After a great deal of doubling back and forth, we reached the remains of the Iona Marble quarry, situated in a cleft running down to the sea between cliffs from which the stone had been quarried. The site may have been worked as early as 1745 by the Earl of Breadalbane when he founded the Marble and Slate Company of Netherlorn. The quarry was officially opened in the late 1700s by the Duke of Argyll but did not operate for long because the marble was difficult to extract and transport was uneconomical. There was a failed enterprise by the Argyll Quarry Company in the 1800s, which hoped to extract the stone and ship it from the island on an industrial scale, but the remote and rocky location proved too hazardous for shipping. However, a final attempt was made to extract stone when the quarry reopened again in 1907. But it closed for the last time at the end of World War I. 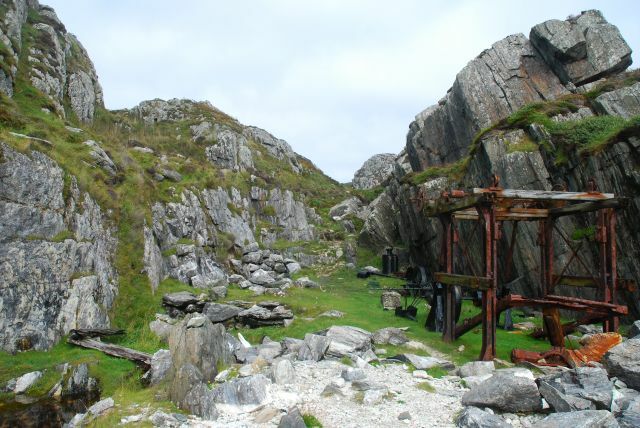 Today all that is left are the very rusted remains of machinery from the pre-First World War period of quarrying – a large winch and cable, a cutting frame, water tank, gas engine – many of which have been painted black by the Scottish National Trust that looks after the site, now listed as a Scheduled Ancient Monument. The return from the quarry to the village involved crossing another boggy stretch before, finally, we reached the end of the moor and saw the scattered houses on the outskirts of the village. We came down to the paved road and the shore just as a ferry approached the jetty. We had lunch and rested awhile at the Martyrs cafe before moving on to explore the northern part of the island. As the road leaves the village it climbs slightly, passing organic vegetable gardens for two of the hotels before the ruins of Iona Nunnery appear on the right. 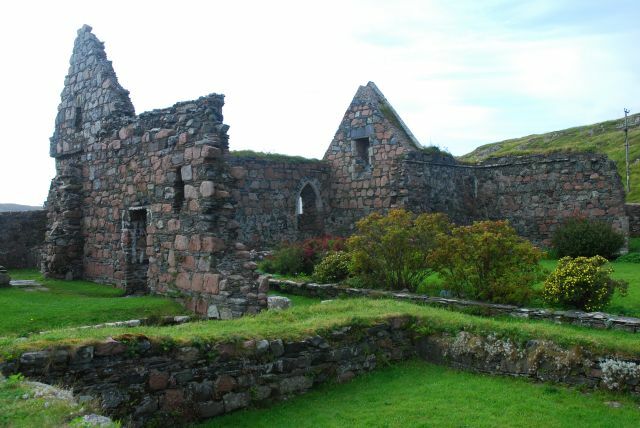 The Nunnery was built in 1203, one of only two houses of Augustinian nuns in Scotland. It was made derelict during the Reformation. The walls are of an interesting construction: pink granite blocks are interleaved between layers of slate. Despite its ruinous state, this is one of the best examples of a medieval nunnery left in Britain. 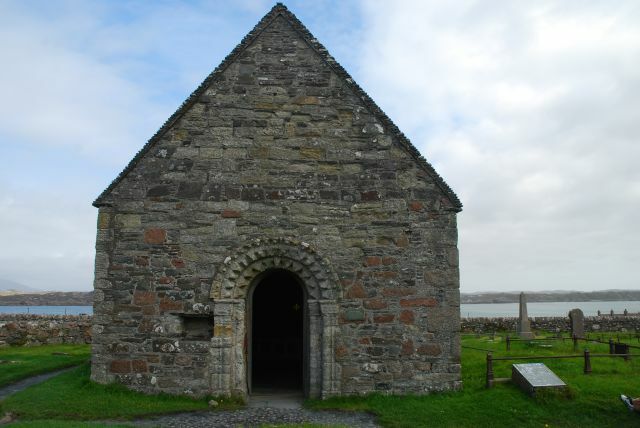 Next to the nunnery is St Ronan’s Chapel, a small building was the islanders’ parish church from around 1200 to the Reformation in 1560. Excavations have revealed that there was a chapel on the site as early as the 8th century. 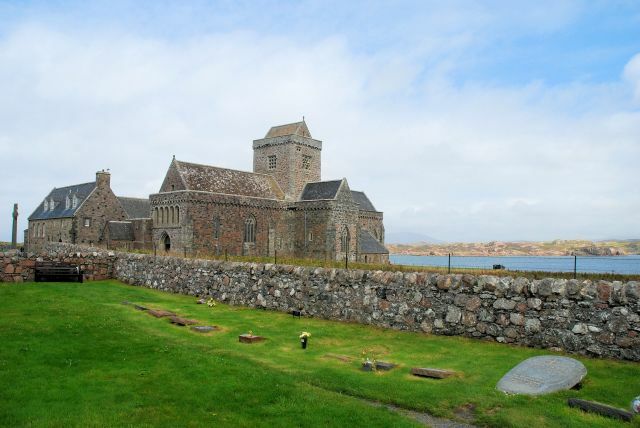 The chapel is surrounded by a graveyard which contains the graves of several Scottish kings as well as monarchs of Ireland, Norway and France. 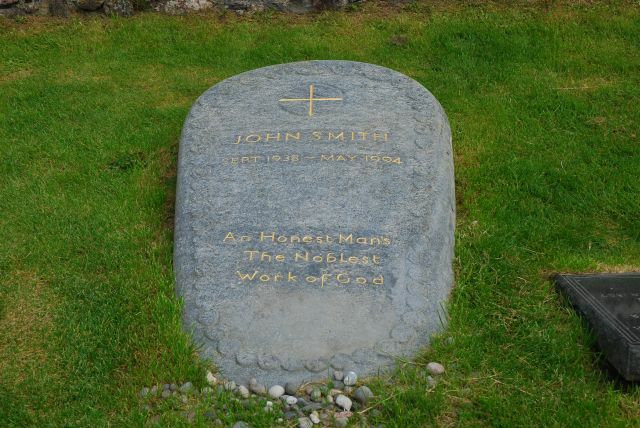 By the wall near est the sea is the grave of John Smith, former leader of the British Labour Party. His grave is marked by a stone with an epitaph quoting Alexander Pope: ‘An honest man’s the noblest work of God’. John Smith died of a heart attack in 1994 at the age of 55. 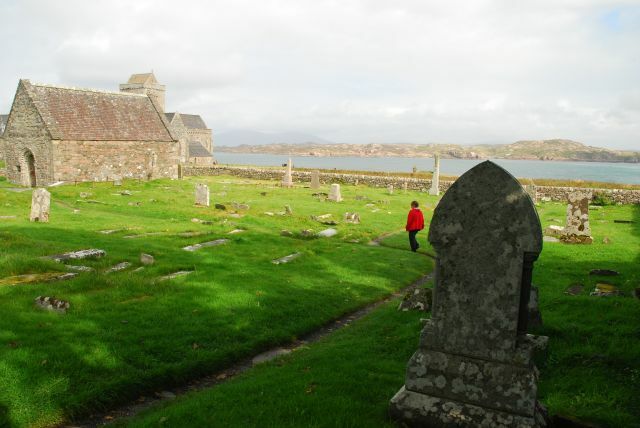 He is buried here because he and his family spent many summer holidays on Iona, a place he loved deeply. However, many islanders opposed the decision to grant John Smith – a mainlander who grew up in Argyll – a plot in a cemetery normally reserved for locals and their descendants. Looking down at his grave, I remember the deep sense of shock among Labour party members and supporters at the time of his death. Although Smith was by no means a left-winger, a kind of wistful nostalgia for the Prime Ministership that never was has grown up among those for whom Tony Blair is an anathema, concisely expressed in the article, ‘What if John Smith had lived?’ by Francis Beckett in The Guardian last year. Who can say how things might have turned out – but I have a gut feeling that Smith would never have ignored the legal advice that an invasion of Iraq would constitute an act illegal in international law, or relied upon a meretricious dossier to justify the action. 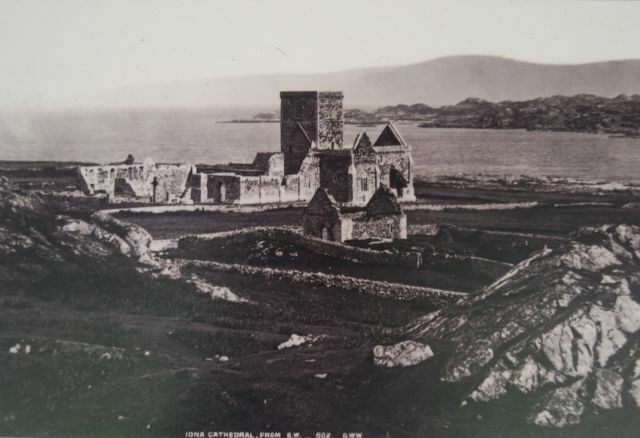 Iona is a place of pilgrimage because this is where St Columba established his mission from Ireland in 563, credited with bringing Christianity to the Picts who inhabited Scotland at the time (though in this clip from the BBC series Scotland’s History, Neil Oliver questions the accuracy of that belief). The abbey that stands beyond the graveyard belongs to a later era than Columba, who, seeking seclusion, had little interest in grand buildings. Almost nothing remains of the original monastery he established here but traces of the that surrounded the monastic enclosure that would have contained a modest timber church, surrounded by huts for the monks to live and work in, and small cells for solitude and prayer. 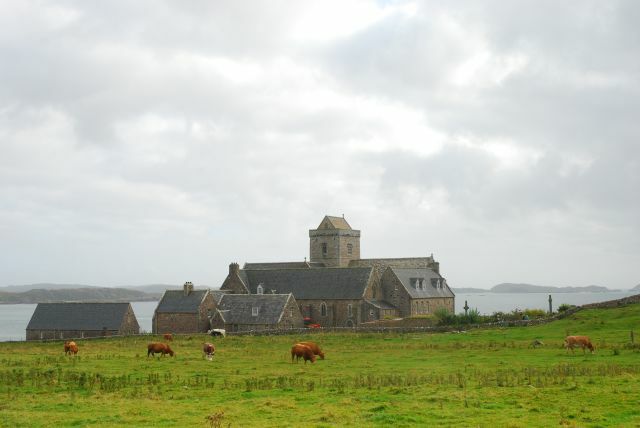 In 1203, the Lord of the Isles invited the Benedictine order to establish a new monastery, and the first Nunnery. The abbey has been restored. The Abbey was substantially expanded in the fifteenth century,but following the Reformation, was dismantled and abandoned. The building we see today was substantially rebuilt in the 20th century by the Iona Community. On the lawn outside the abbey is a board with this photo showing the ruins at some time in the late 19th century. At the door of the Abbey stands a replica of the St John Cross (the original can be seen inside the Abbey). Carved more than 1200 years ago by craftsmen who worked at the abbey. It was just one of many crosses which showed pilgrims the way to the abbey, as well as being places where people would stop and pray as they passed by. The original St John’s Cross is in pieces today. The carvers wanted to build a huge and impressive cross – but overdid it. The arms of the cross were too long, and it collapsed almost as soon as it was built. They tried to fix it by adding the stone rings, but that didn’t work for long either. In 1970 the replica cross, made of concrete, was built which now stands outside the abbey. Just outside the Abbey stands St Martin’s Cross, another impressive cross with Celtic designs. It’s the most perfect of the surviving crosses on Iona, it still stands where the monks of the monastery placed it twelve hundred years ago. The cross is 17 feet hight and is carved from a stone that originally came from Argyll on the mainland. The raised circles, or bosses, are thought to represent God with everything revolving around Him. Intertwined between these bosses are serpents, which in the Celtic world represented rebirth since the snake sheds its old skin. The ring around the cross head represents eternal life and is a common feature in Celtic Crosses. From the abbey, the paved road continues past the low hill of Dun I, the highest point on the island. 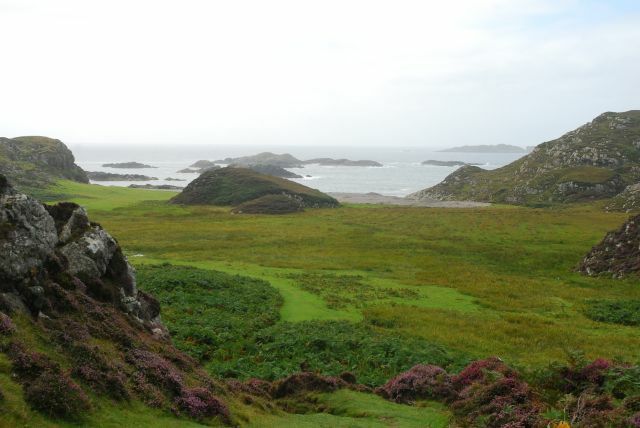 Dun is Gaelic for hill, and I is what Iona was once called. 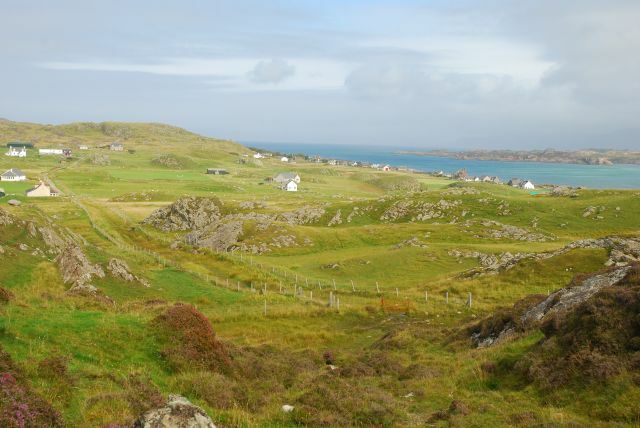 The Hill of Iona is a place from which it is possible to see the whole of the island. From here, a path continues to the northern shore – but for us it was time to turn back to catch the last ferry returning to Mull. At Fionnphort, the ferry was met by large wagons onto which catches of fish and seafood were being loaded. A large seal was in close attendance – we guessed it probably knew this happened at the same time every day, and anticipated being thrown some scraps.